Hot Rod, Pin-up, Tattoo Art from around the country. We invite you to join us in a proper kick off of new venture with a big ol’ Grand Opening Party, Art Show & Car show all in one! 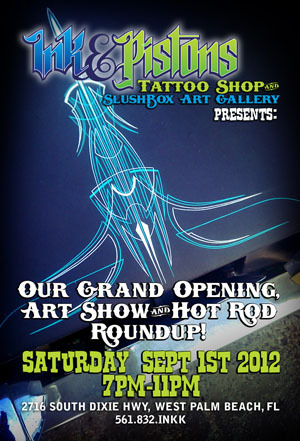 Come help us solidify our vision for a unique space which merges Tattoos, Hot Rods and Art together seamlessly into one 2,500 square foot facility. -Art show featuring work from over 20+ artists who work depicts Hot Rods, Hot Chicks, Pinstripes, Kustom Kulture, Tattoo inspired art, Day of the Dead, Tiki and anything else we find fitting. 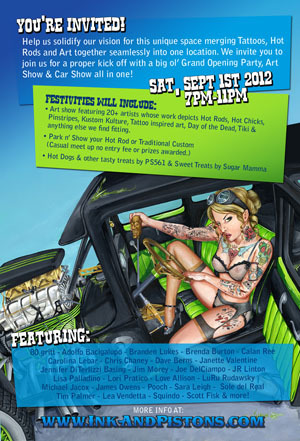 -Park n’ Show your Hot Rod or Traditional Custom Casual meet up no entry fee or prizes awarded. -Hotdogs from PS561 and Sweet Treats by Sugar Mamma Sweets.